BEIJING—A panda at a zoo in northwestern China, unimpressed with the food offered at his new lodgings, erupted with rage and sunk his teeth into a staff member's flesh instead, local media reported on Monday. “Lan Zai had only been there a week and had not acclimatised to Lanzhou,” the report quoted a zoo official as saying. “In the first two or three days, he did not eat anything … When the worker was preparing some bamboo for him to eat, he suddenly clawed at him,” the official said. Doctors spent more than two hours patching up Xiao Zhang's wounds. The worker was still in hospital, the report said. Another newspaper said he had had 100 stitches. An estimated 1,600 wild pandas live in nature reserves n China's Sichuan, Gansu and Shaanxi provinces. China keeps about 210 in captivity. 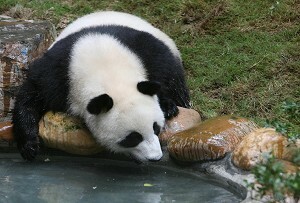 Pandas eat bamboo shoots and spend a lot of time sleeping.